Ridiculous Infomercial Review fan Sharon Haughey sent me an email about a commercial for a product called DramaTel. Billing itself as “The Almost Illegal Phone Card,” DramaTel allows a caller to appear to be calling from another phone number so as to fool the recipient. What a perfect idea for the Jerry Springer and Maury Povich audience! The folks at DramaTel would make a bundle if they would advertise their phone card on those talk shows and then offer a paternity testing kit as a free bonus. Not since the old Myotron infomercial have I seen a TV advertisement featuring such a cheap and hokey dramatization. This commercial really deserves to be called ghetto—in every sense of that word. One part that doesn’t seem quite realistic comes at the beginning when the woman calls the playa and his phone identifies her as “Baby’s Momma.” How is that ID supposed to help him? It doesn’t tell him which Baby’s Momma is calling him. 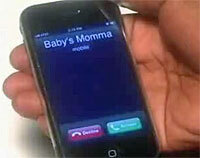 His caller ID should have said something like “Baby’s Momma #8” so he could know which one is calling. That “voice changer” feature lets you disguise your voice as a male or female. The DramaTel commercial gives a brief example of the male voice. But unless the person you are trying to imitate sounds like Satan on a heavy metal record spinning backwards I’m not sure how useful this feature really will be. There are a few shots shown here—such a the playa poolside and the white guy named “John Smith” befuddled by phone records—that offer hope that more ads or even a full-length infomercial will be coming forth from DramaTel. The commercial tells us that DramaTel can also help you “be a cheater.” I would love to see an ad where some man uses DramaTel to keep his playa hand strong. The line “You been DramaTeled, playa!” is classic and deserves to be as famous as “I’ve fallen and I can’t get up.” I fully expect “dramatel” to be featured as a verb in the next edition of the Oxford English Dictionary. Wow…. Hardly am I ever but this time I am…. speechless…. So awesome I am actually at a loss for words. So let me get this straight…DramaTel can help you to catch a cheater AND be a cheater? What happens when two DramaTel users enter into a relationship or friends with benefits situation? Do their memberships cancel each other out? Is antimatter created? Aaaaaaaah my mind is spiraling out of control. So on my work phone where I have to pay for the personal calls I get they could showup as coming from the company phone number. When I want to call somone who dosent except blocked numbers I could make it showup any number. I am stunned into submission. Truly, truly, truly, Hall of Fame material here. BRAVO, I SAY! Hello, I’m Joey Greko from “Cheaters”, who was talking to you, pretending to be your girl. Opps! I misspell my own name; it should have been Greco. I can’t believe how awesome that just was. Your commentary is way too funny. Yo Infomercial-Hell, it’s Katie! I’m just leavin’ a comment to say…this ain’t Katie! You’ve been DramaTel’d! I wouldn’t be the least bit surprised if this company has since gone out of business (no way am I clicking on the DramaTel link to find out). 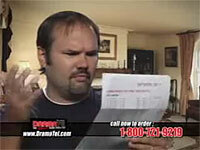 DramaTel.com was a successful calling card manufacturer and direct-response TV novelty. All intellectual property for the DramaTel brand is now for sale. Everything I’ve posted here is exactly as written on the website, although just how “successful” DramaTel really was may be up for debate. WOW! My wife and I actually saw this commercial a few years ago in the middle of the night. It was so ridiculously funny that we thought it was a hoax and kept waiting for the punchline…but there was none!